Cartier’s Métiers d’Art Collection is one of those special and very limited production series, in the Cartier watch collection, made for the really connoisseur. These pieces are hard to to get your hands on, since they rarely appear in a Boutique, due to the limited amount of produced items. In response to previous Cartier’s SIHH presentations, we have reported briefly about these gems. But now, since the well known French based photographer, Fabien Sarazin, who also works for LVMH and Channel, recently shot the five watches that were presented last January, só mouth watering, we have an extra reason to show you his photographs and bring the watches again under your attention. The technique used for Cartier’s Métiers d’Art Collection is not easy to describe and is different for almost every watch. Cartier uses techniques and skills from the past as well as newly developed techniques by the Cartier team. Different craftsmen, like enamelers, sculptors, engravers and specialists in marquetry are all working together on this series, to ensure that the visual effect of these watches will be at it’s best, when the design of the dial is finally finished and the dial is ready to be fitted in it’s case. The mix of different blues greys and violets resulted in a dial, where one almost can feel the water. 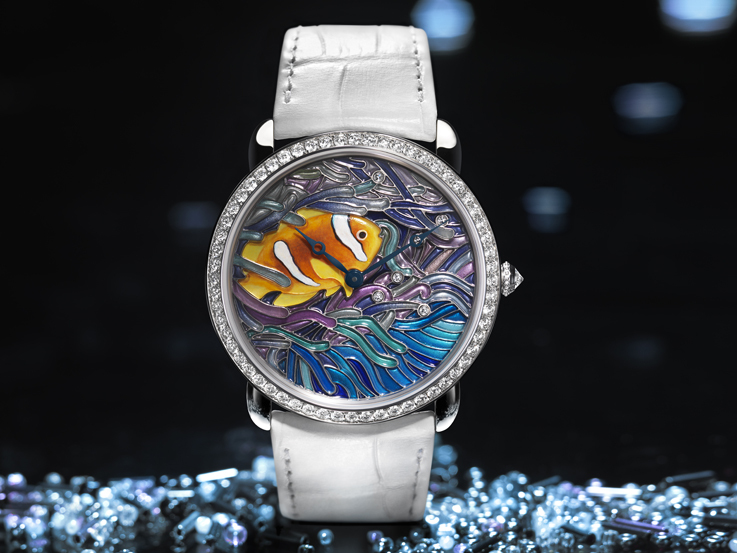 The dial is plique-a-jour enamel with an added mother of pearl painting, with a Clown fish in relief. Almost a view from a submarine, deep on the bottom of the Indian Ocean. The rhodium-coated 18-carat white gold case, is set with 61 brilliant-cut diamonds totaling 1.57 carats and the crown is set with a brilliant-cut diamond. The adjustable double folding buckle in rhodium-coated 18-carat white gold, is for this watch, set with 43 brilliant-cut diamonds, totaling 0.42 carats. 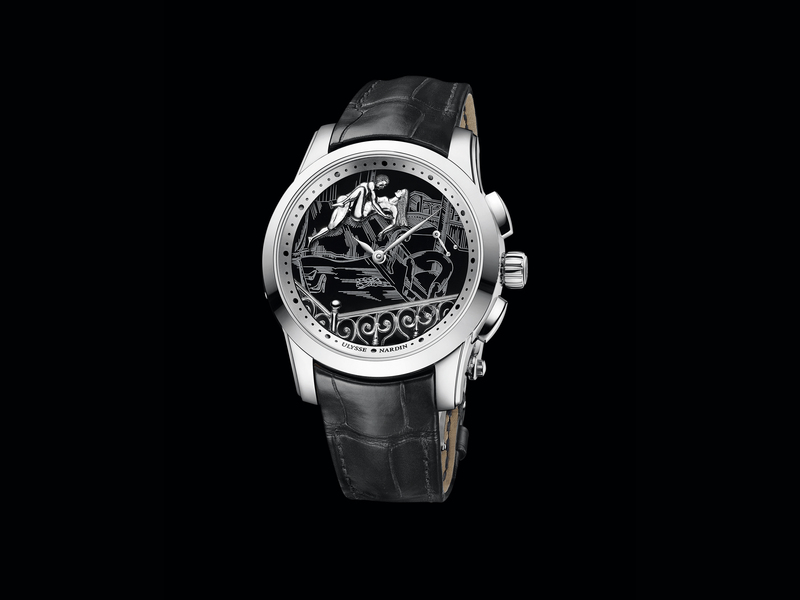 Mechanical wind movement, calibre 430 MC. 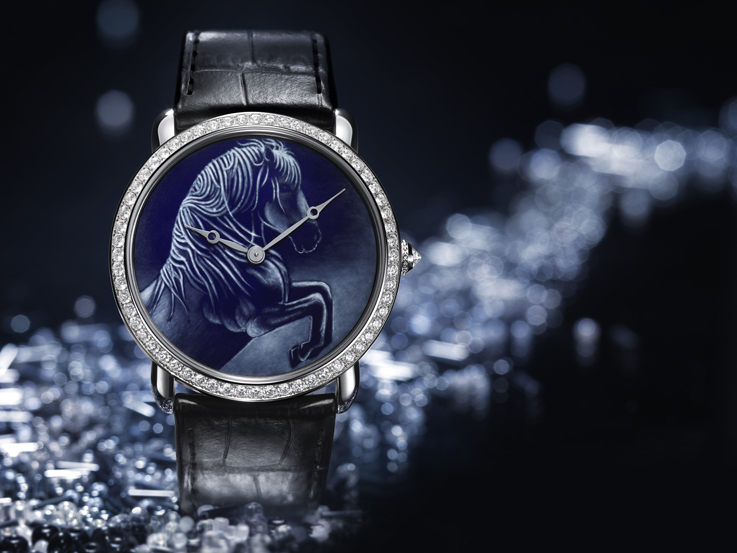 This Ronde de Cartier is a limited edition of 30 pieces. The stern look and the different shades of grey and blue, make the falcon look straight in the eyes of it’s owner. An almost realistic experience. 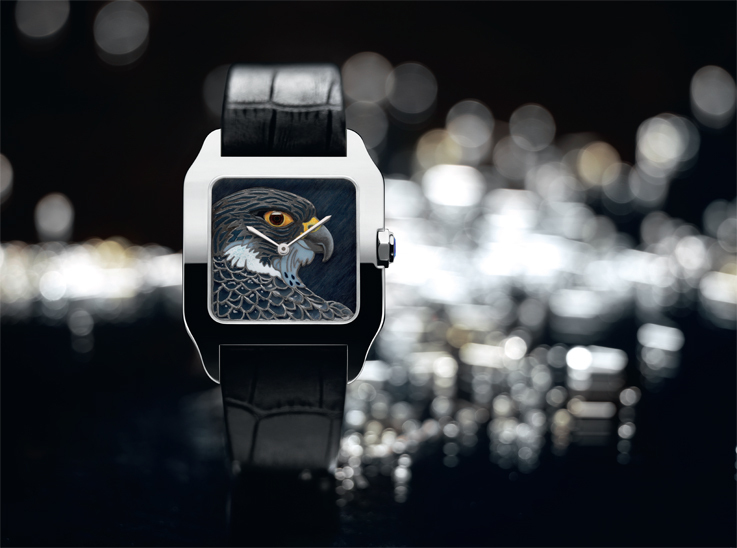 The matt mineral black background is carefully chosen to let the details like the beak and feathers stand out. The rhodium-coated 18-carat white gold and almost square case, is set with 49 baguette-cut diamonds, totaling 6.31 carats and the crown is set with a brilliant-cut diamond of 0.34 carats. Double adjustable folding buckle, like most Cartier watches have these days, here in 18-carat white gold, set with 37 baguette-cut diamonds totalling 0.85 carats. 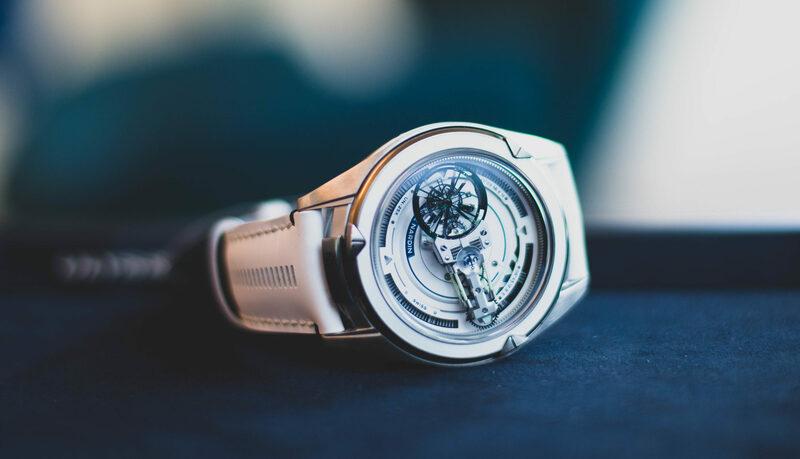 The Santos is produced in an edition of just 20 pieces, is water-resistance to 30 metres / 100 ft / 3 bar and has a manufacture mechanical movement with manual winding, calibre 430 MC. One of the largest reptiles on earth, the crocodile, is here created by the gem-cutter, as if he is emerging from the waves. The various gradations of blue and sparkles of light illustrate clearly the feel of moving water. It does require a special expertise to bring out the nuances of the agate, ranging from blue-tinged black to shimmering white, without damaging the stone. The Rotonde de Cartier crocodile has an 18-Carat white gold 42mm case with sapphire back and beaded crown set with a sapphire cabochon. 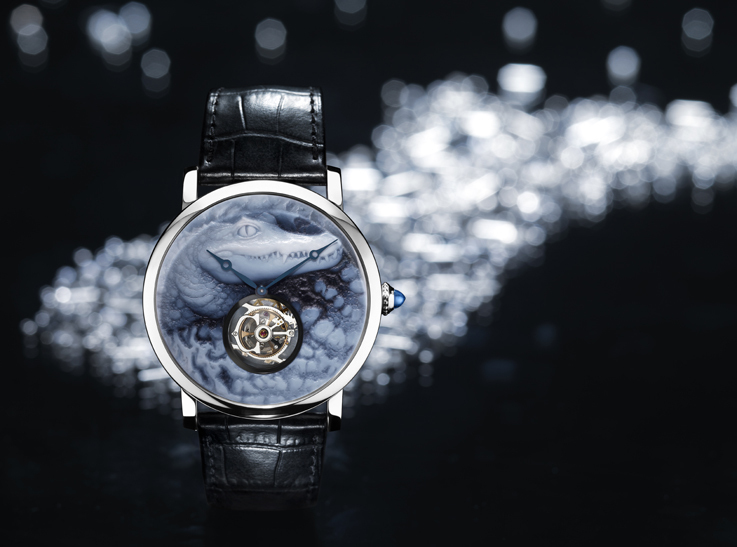 The dial is in 18-carat white gold with the crocodile motif in a cameo of natural agate. A black semi-matt alligator skin fitted in a double adjustable folding buckle in 18-carat white gold. Like the other models in the series the water-resistance is 30 metres / 100 ft / 3 bar. Manufacture mechanical movement with manual winding, produced in house, calibre 9452 MC, certified Geneva Seal, flying tourbillon with seconds indicated by the tourbillon carriage, in the form of a C.
Just 30 pieces are produced of this tourbillon watch. 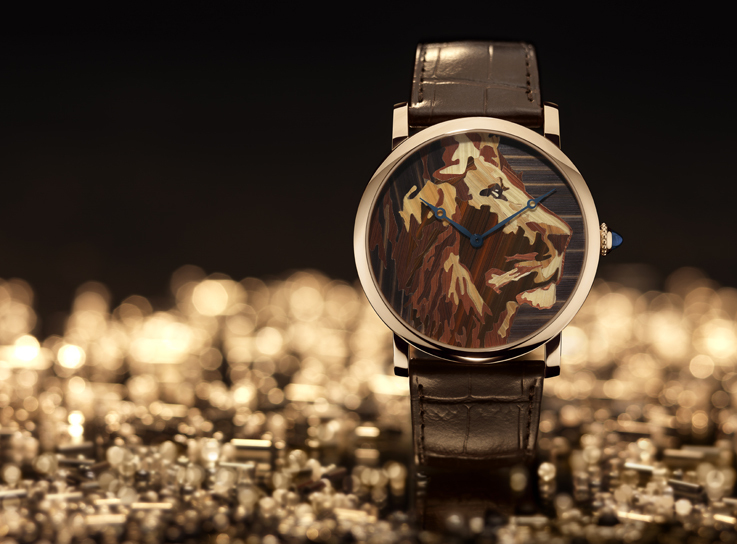 The Cartier designers came up with this wonderful idea of using straw marquetry to create this feline. The gradations of colour in the lion’s mane, are captured perfectly, by the shades and brilliance of this unusual material. Straw is a material that is rarely seen in watchmaking and that Cartier used for the first time, two years ago, for its delicacy and unique softness. The Rotonde de Cartier case, with sapphire back is in 18-carat pink gold and has a beaded crown set with a sapphire cabochon, 18-carat yellow gold dial with lion motif in straw marquetry.The semi-matt brown alligator strap is fitted with a the double adjustable folding buckle in 18-carat pink gold. Water-resistance: 30 metres / 100 ft / 3 bar and the caliber is a manufacture mechanical movement with manual winding, calibre 9601 MC. Just 70 pieces are produced of this time piece. Cartier Métiers d’Art Watch Collection, is a unique series that must be seen in the flesh, to experience the real beauty and craftsmanship.